I will admit, I’ve called it Duck Tape. But when my husband complained I was able to prove that there really was such a thing. When I served in our church helping with set up and tear down, duck/duct tape was the miracle tool. You can fix a lot of things with duck tape. We found out from our doctor that if you have a plantar wart – put a piece of duck tape on it and eventually when you pull it off- the wart will come with it (we haven’t fully proven this to be true yet). 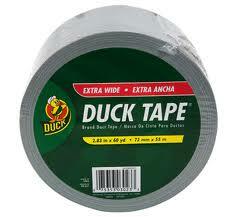 I used to carry duck tape in my car. See I had a child who decided that he was smarter than those complicated five point harnesses I would wrestle with to get him in his car seat. So he would undo them. While I was driving. So I would pull over, put him back in. He would unbuckle. I would pull over again. Buckle him back in. He would escape. I yelled, I threatened and one day I sat for over an hour while one child fought me on this. I think the people whose house were in front of thought we were stalkers. Um, yeah. Right. Like a degree automatically means I know everything? Hello people! So I figured I needed to find a foolproof way to keep my escape artist kid in his car seat. All it took was ONE TIME. I buckled him back in and then strapped duck tape around him to the chair (not touching any skin). He couldn’t move. He couldn’t get his hands close to anything. And I made it home with him safe and secure. After that, when he started to unbuckle I would lift up the roll of grey tape and ask him if he wanted me to duck tape him into his seat. He would whimper and stay put. Whew! Funny thing is, He was never a kid who escaped his crib at home. That would have taken a whole lot more duct tape.